Celebrate the feast of St. Francis, pet blessing services, or any occasion with these greeting cards featuring Francis of Assisi accompanied by animals. Cards are blank inside for your own message. 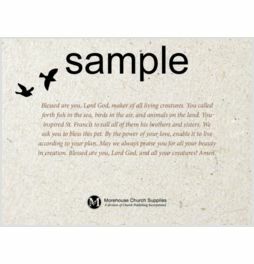 The Prayer of St. Francis is printed on the back of each card. Printed using eco-friendly soy-based ink on heavy duty card stock. Gift-boxed with 12 matching envelopes.